A raised toilet seat is an extension that fits on a porcelain toilet bowl and is held in place by brackets. It can make it easier, and safer, to get on and off the toilet. Raised toilet seats come in different heights – the most common are 2 inches, 4 inches, and 6 inches. The best height for you will depend on your height, the height of your existing toilet, and your personal needs. However, raised toilet seats don't fit all toilets. If you can't find one that fits your toilet you may need to use a toilet frame. How do I install a raised toilet seat? A raised toilet seat is clamped directly onto the rim of a toilet bowl. Don't try to attach it to the seat. You may have to remove the original seat and lid, or ensure they remain up all the time. Follow the manufacturer's instructions for fitting your seat to your toilet. When a toilet seat is fitted correctly it shouldn't move or wobble. If it does, don't use it until it is properly secured. Once it is on, don't remove it, except for cleaning. Once you have taken it off for cleaning, make sure it goes back onto the same toilet it was fitted to. How do I use a raised toilet seat? 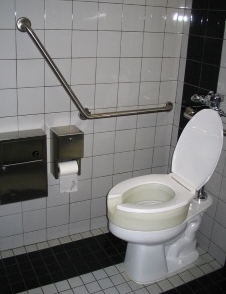 Make sure the seat sits firmly on the toilet bowl and is not placed on top of any other equipment (for example, don't try to put it on top of the original seat or a raised toilet frame). Every time you use the toilet, check the seat beforehand and make sure it is firmly attached. If it isn't, ask someone to tighten the brackets for you. Don't hold the toilet seat for balance when lowering yourself on to it, or to push yourself off when you get up. If you do this, the seat can tip and you could fall. If you find yourself trying to do this, talk to an occupational therapist about what is safe for you. Don't stand on the seat. If you gain a lot of weight the seat may become unsafe. Talk to an occupational therapist about whether it is still safe for you. Regularly check that the seat is still at the right height for you. If you have children who use the same toilet, it may help to buy a small step for them to use. How do I clean and maintain a raised toilet seat? A raised toilet seat is in constant contact with moisture and body fluids. You need to monitor it carefully for any signs of wear and tear. Check its condition, and how well it is fitting, at least once a month. Don't immerse the seat in water, as the inside will fill up with water, which is difficult to get out. You can clean the seat with soap and hot water. It's best not to use an abrasive cleaner, as this will scratch and damage the seat. Make sure you remove all the nuts and brackets and clean them well. Undo the clamps and clean the seat thoroughly underneath. If it's not kept clean the rubber can break down, which will make the seat slip.